We have a fabulous little hole-in-the-wall Thai place right around the corner from our home. I’m embarrassed to admit how often I think of their coconut chicken curry. I want to call up and request just a tall glass of their coconut curry sauce. Mmmmm Mmm. I could just drink it! 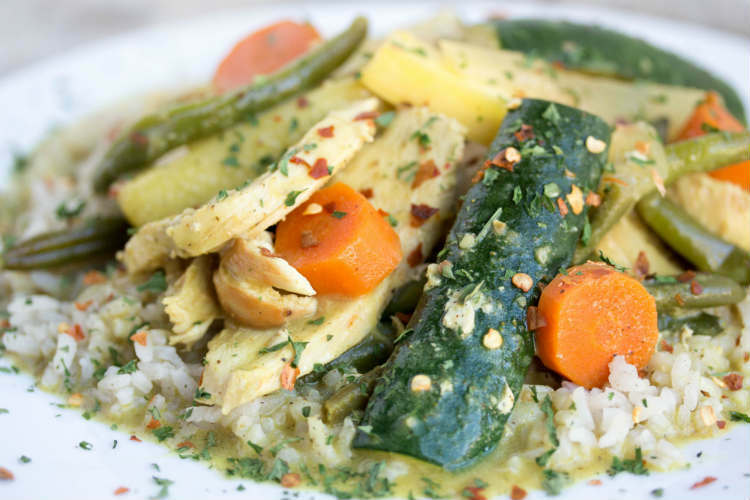 Since I can only tame that temptation for so long, I have been in the kitchen tweaking and playing with this coconut chicken curry recipe for awhile now. FINALLY I can now daydream about my own coconut curry recipe. One of the most common questions I get about coconut milk is whether I use the canned or carton kind. Well… it depends on the recipe, and I’ll make sure to specify when I mean the canned coconut milk. 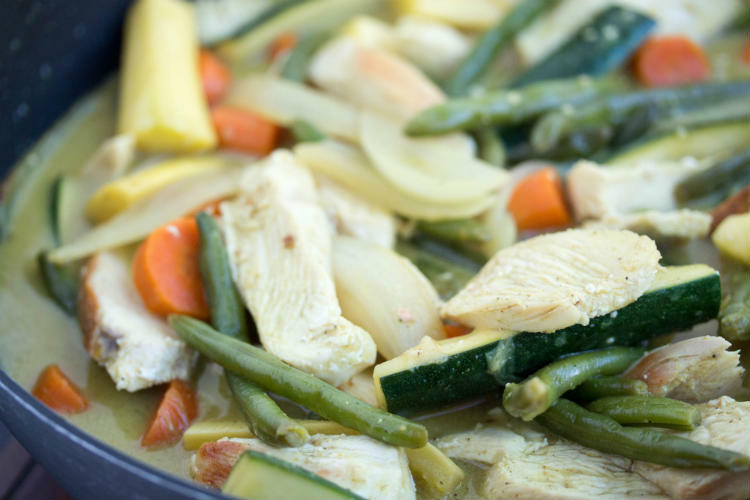 For coconut chicken curry, definitely use the canned kind. Coconut milk is loaded with fat! Don’t be scared though, my friend, this fat actually helps with weight loss, reduces heart disease, and does many many more wonderful things for you. When purchasing coconut milk, purchase the full fat and NOT the light. The only difference is light canned coconut milk has added water which dilutes the coconut meat. It’s a waste of money, doesn’t taste as great, and this is one cream you can totally indulge in. I have 2 kids. I have busy days. Some days I don’t want to cook. Am I alone? I’m betting not. This is now one of my quick, go-to dinners. I start preparing the dish while the rice is cooking and everything is usually done at the same time. 30 minutes in. 30 minutes out. I have lots and lots of quick dinners like my Easy Sausage, Potato, and Carrot Stew and Easy Chicken Spaghetti. Stick with me. I’ll take care of you at dinnertime. 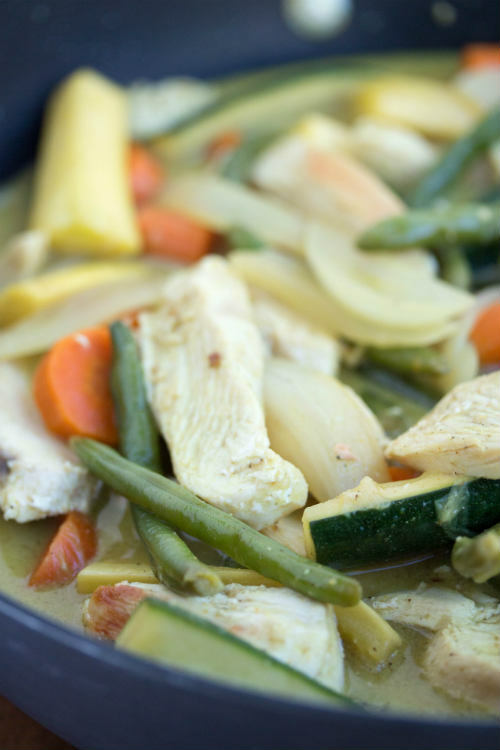 Warning… you’ll quickly become addicted and daydream of this coconut chicken curry just like me. Proceed with caution. In a large skillet, bring 4 cups of water, 1 tsp salt, and 1 tsp pepper to a boil. Add brown rice and quinoa. Cover and reduce heat and allow to simmer for 25 to 30 minutes until rice is tender. In a small bowl, whisk together coconut milk, 1 tsp salt, 1 tsp pepper, curry powder, and crushed red pepper. Set aside. Meanwhile, in another large skillet, heat oil over medium heat. Add chicken breast pieces and cook for 3 to 4 minutes just until no longer pink. Remove chicken from pan and place to the side. Return skillet to medium heat and add onion, garlic and carrots. Cook for 2 to 3 minutes until onions are translucent and carrots slightly tender. Add coconut milk mixture and bring to boil. Add zucchini/squash and green beans. Cook for additional 1 to 2 minutes only until squash slightly tender. Return chicken to curry and remove from heat. Serve over brown rice/quinoa and enjoy! I haven’t ever cooked with curry, but I might have to try this! 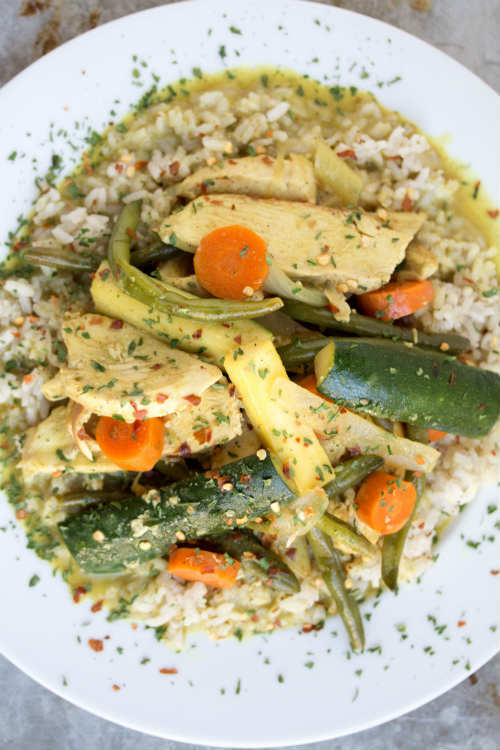 Coconut Curry is our most favorite Thai dish! I think you’ll really enjoy this. Let me know what you think! 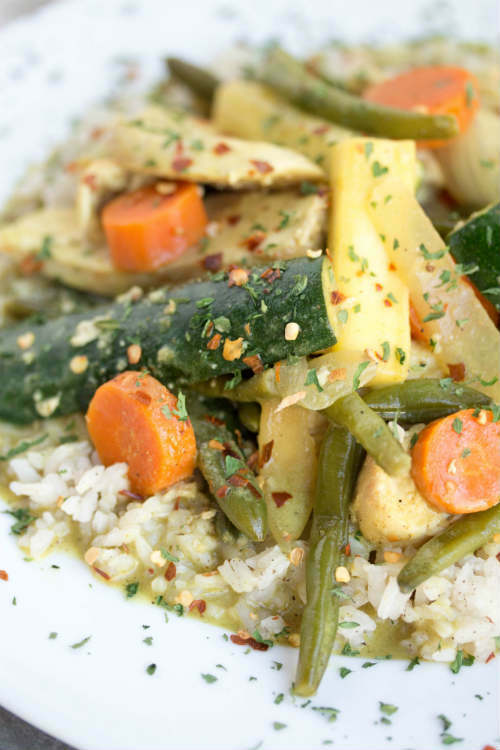 Mmm I love coconut curry and this looks divine! I can’t wait to try this one out! 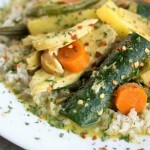 I looooooooove Chicken Coconut Curry, but I’ve never tried to make it myself! Thank you, I’m totally going to try this! Thank you, Miss Angie! Let me know what you think. I’m not normally a curry fan, but I could get behind this! We love curry at our house! I actually just had Indian Butter Chicken for lunch – this reminds me of that 🙂 Yummy!!! Ooooh… Indian Butter Chicken? Sounds delightful. Is it on your site?